This is one of those whose name has been mucked around with after it has been widely distributed throughout Australia as grahamii. It must have come in a long time ago as many people remember picking and sucking the flowers for its nectar as children. Not many children do that these days. You can do that with a number of salvias but this is the one known for it, probably because it has been in circulation so long. 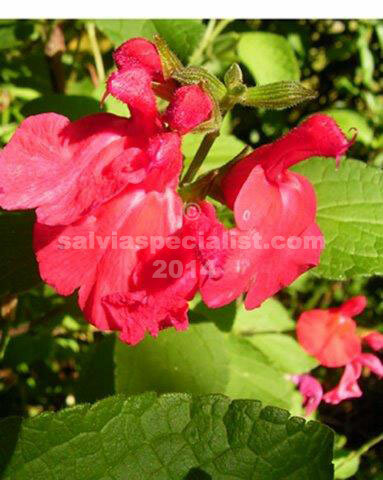 This is an incredibly hardy shrub usually growing less than 2m high and can be 2m wide. The foliage is a light green. It suckers gently or will layer. The flowers are a soft red and are year round but probably most in spring. It flowers well enough in shade but probably better in sun. An established plant could be hedged or pruned as and when you fancy, though mid summer could be an optimum time for not cutting off flowers. It also recovers quicker then too. It grows easily enough from cuttings. Microphylla red is a similar sort of plant but darker foliage and a good solid red and generally half the size plant. It also flowers year round but most in spring.